My adventure in salt water aquariums started in July of 2009. My wife had a tank growing up and was excited to try it again. We jumped in with our first tank (55g) and quickly learned from our mistakes. We loved the challenge and found species only tanks a thrill. We have had 2 Garden Eel tanks and absolutely love everything about them. Our desire for more tanks quickly grew, before we knew it we were planning our dream 180g tank. We carefully planned this tank and used the WMAS club for a lot of information. To date we have had 3 55g tanks, a 40g breeder, an 8g all-in-one and now our new 170g cube. We have been WMAS members now for almost 7 years. My wife and I love to continue our knowledge by going to club speaking events and even traveling for large shows like Reef-a-Poolza, MAX and MACNA. I have been married 11 years now to my wife Bacot, we both have a passion for saltwater and are happy to be enjoying this hobby together. We also share a love of diving and enjoy diving whenever we can in the Caribbean or Florida Keys. One of my fondest diving moments was diving with reefing celebrities in the Florida Keys for CRF (amazing organization). Our love for glass cages has also expanded to 3 species of Dart Frog, our Panther Chameleon and a Bearded Dragon. I am excited to start my 4th year in WMAS Presidency and 1st as Vice President. My interest and participation in reefing began about six years ago when I met my, now, husband Dennis. I got hooked on him and reefing, in that order, and we've been reefing together ever since! Our daughter, Tawni, enjoys our fish tanks very much as well. She knows the names of our fish and loves the bright colors of the corals. I think we've got a future reefer on our hands! A couple other hobbies of mine are reading and cooking, but my favorite thing of all to do is spend time with my family. I have kept fish since 1990 and got into salt water in 2007. I owe all my success in this hobby to this club. I love everything about the sea...especially mermaids, and I just love marveling at my own little piece of the ocean. I married my high school sweetheart Bryan. After graduating from Westminster College I taught middle school for several years and in 2003 opened my own art business Camillion Creations. I left my teaching career to raise our four children, but I am still painting and selling my artwork from home. Dennis grew up in Las Vegas and graduated with a degree in Business Management from UNLV. Although he has lived several places over the years, including Preston, Idaho and Logan, Utah, his favorite place to be is with his family. Dennis is a devoted husband and father, expecting the newest addition to his family, a baby girl, on August 24th. Dennis works for the Boy Scouts of America as a Senior Store Manager and oversees several Scout Shop stores in both Utah and Idaho. While he has many hobbies, reefing is Dennis's favorite and over the years it has become a family affair at the Wimett house. Dennis's wife, Ayla, and his five year old daughter, Tawni, have a great time caring for and enjoying their fish tanks together with him. Dennis has considerable experience in the saltwater hobby spanning almost two decades. He has a variety of corals in his largest tank including SPS, LPS, and a few softies. When it comes to fish, Dennis has pretty much had them all: the good (tangs, clowns, firefish, the occasional wrasse minus the six line), the bad (finally caught that ! @#$ damsel), and the ugly (pajama cardinals-we all know it's true). Dennis's dream is to get a larger tank up and running someday, although right now he is content with his 90 gallon and two nano tanks. That's right, Dennis is a tankaholic and proud of it! I began my saltwater career with a 6 gallon tank I bought from Petco on a whim (which I still have btw) after I got married and got rid of my ball python clear back at the beginning of 2012...I know, not that old or experienced in the saltwater world, but if mistakes make you smarter, I'm a genius! I've had freshwater tanks most of my life and have enjoyed them, but I've always loved saltwater tanks and the colors and diversity in them. I'm into Blastos and fish and my wife is into fancy mushrooms and anemones. My favorite marine animal is the mantis shrimp followed by the cuddle fish. We've learned a lot from this club and have made a lot of friends from this club. So, if your new, welcome, and if your old, keep breathing. I've been in the hobby for almost 42yrs and I've been a member of the WMAS for 2 1/2yrs. I'm from CT, and enjoy real seafood. I grew up by the shore and marshland in a small town called Westbrook. So there is where I fell in love with the sea and all it holds. I hope to meet more people with the same level of passion as I.
I'm Jeff the DIY Dude. I have had aquariums since I was old enough to convince my mom that I could take care of one. I didn't get started into Saltwater until a few years after I got married. That was just over 28 years ago. I was quickly hooked and had many FOWLR tanks for 11 years. After doing FOWLR for that long I started getting into reef keeping. It was hook line and sinker from that point on. Within a year of starting my first reef, I also started a basement LFS and aquarium maintenance service. I build that business for 9 years. Some in the Kaysville area may remember my store front on 200 south just east of the freeway called Prestige Aquatics. That phase passed and I sold the entire business off as well as my own tanks. Working full time and running a LFS and Maintenance company had taken its toll.
! thought that I was done with anything fish related. Hahaha. I stayed away completely for 6+ years. Then a good friend and neighbor bought a JBJ 28g Nano cube. She quickly realized she was in way over her head and somehow the information about my previous fish life slipped out. She immediately began picking my brain and having me over almost every night to help her get things under control. Long story short, we were able to get her nano setup, stabilized, running well, and growing like crazy. I was once again hooked. I am a computer geek and IT guy by day and a Harley/saltwater guy by night. I have been on WMAS since 2012 and a member since 2013. I love doing DIY aquarium projects from sumps, to LEDs, to reactors. I love the tech gadgets available in the hobby today and usually have my hands into something new. I look forward to seeing where I can help as a member of the Presidency. My entry to saltwater occurred four years ago when a neighbor introduced me to the beauty of salt tanks. My neighbor took me to the Reef Fest where I heard about water chemistry, lighting, frags and wrasses. It was all over my understanding, but I did get to meet Reefy Buddy. I purchased a used 55 gallon and spend about four months collecting equipment, building the stand and putting it all together. Attending frag fests quickly filled the 55 so we added a 120 gallon. The 120 took about six months to set up and is on an open base table with all the support equipment is located in the adjacent storage room so the tank appears to be sumpless. My son and I have been actively engaged in building LED lighting systems for ourselves and friends. We have also repaired many LED systems for other reefers. We currently have a 55 gallon aggressive tank, a 120 gallon reef tank, a 30 gallon frag tank, and a 7 gallon nano (for my grandson). When I'm doing water changes I enjoy scuba diving. I have had the pleasure to dive in Bonaire, Bermuda, Jamaica, the Chanel Islands, Hawaii, Yap, Saipan, Guam, Palau, Pohnpei and several mud holes in Utah. My family has enjoyed the associations made at WMAS and have appreciated all the hard work put in by the past presidents and their councils. This year I felt like it was my turn to give something back for all that I have received and ran for a position on the council. I know Arthur and Jon have some excellent events planned for the upcoming year and I look forward to supporting them. I appreciate the chance to serve this year. Unlike most members of this council I am rather new to this hobby. During my undergraduate studies I took a scuba diving class simply because I needed one more credit to be considered "full-time" It was from there that I took great interest in salt water life. Shortly after graduating from Pharmacy School at Roseman University of Health Sciences in South Jordan, I picked up a 75 gallon tank as something to do with my new found free time. Now that I am completely addicted to the hobby I am upsizing my tank and implementing the new things I have learned along the way. I enjoy this club because it allows you to meet other hobbyists and learn from their experiences. Outside of this hobby I enjoy snow skiing, dirt bikes, longboarding, ping pong and adding new frags to my growing family. I grew up in Centerville where I met my wonderful wife Amy. We currently have two little girls (second just arrived in March 2016). I was introduced to the underwater world at a young age. My father had a fish tank as far back as I can remember. I started with freshwater and then switched over to saltwater in the mid 90's. I have an interest in aquaculture and have raised several species of fish and inverts. 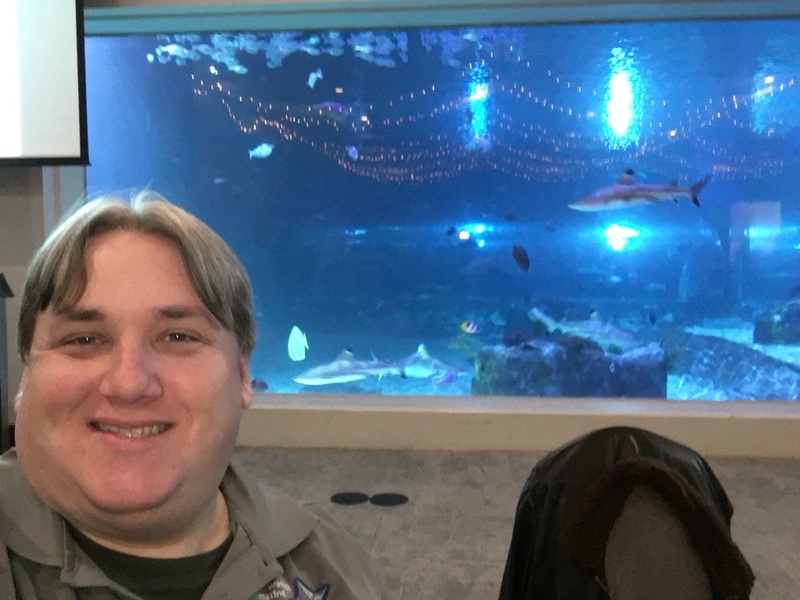 I love spending time with my family, we all enjoy the saltwater world making time to visit public aquariums while on vacation across the USA. Other hobbies include reptiles, amphibians, and koi ponds. Past Presidency Council - Council members are the support staff for the president and the vice-president. I got my start in this hobby at the age of 7, when I won a goldfish at a local carnival. He didn't last too long, but I was hooked...I set up my first saltwater aquarium at the age of 13. At 15, I got my first job ever - working for a LFS that happened to carry SW fish and supplies (a rarity in 1978). Over the years, I've kept almost every type of fish there is too keep; from African Cichlids to Killifish, from Piranhas to Discus; from Lionfish to Seahorses - you name it, I've probably had it. But my favorite has always been the Marine / Reef aquarium. Currently I have a 150 gallon show tank. I have 3 children, and 3 grandchildren. I work for a large pharmaceutical company in SLC. When I'm not messing with my tanks I enjoy bicycling, weightlifting, working on the house and watching football. I've been a WMAS Member since 2007, and served as Club VP from 2012 - 2015. 2016 marks my first year "out to pasture" serving in the Past Presidency Council. I look forward to a great year ahead, working with the current Presidency to make your WMAS experience the best that it can be! I am married to my wife Pepper. We have 4 children. Natalie, Nicole Coral, Jake, and Eli. I am lucky to have them as they all put up with me and my hobby. Some of my other hobbies are fishing, camping, boating (wake surfing), paintball, board/card games, scuba diving, hiking, and backpacking. I started my first salt water aquarium when I was 12. I was 10 gallons and I keep dwarf seahorses and pipefish (believe it or not these were some of the easy fish back then). I had good luck raising and breeding them due to my diligence in raising BBS (baby brine shrimp). I have keep many fresh and saltwater aquariums since then. My favorite freshwater fish is the arowana and my favorite saltwater fish is the frogfish (at least for the moment). I currently have a 180 gallon reef, 55 gallon reef, 65 gallon reef, and a 24 gallon nano. I manage a medical supply company called Premier Medical Distribution. Since 2008 I have also owned Coral Planet. Over the years this company has "morphed" from an Internet only company selling live rock->selling fish and corals->aquarium maintenance->Internet hard-goods->retail store->wholesale fish and corals->wholesale aqua-cultured corals, which is where it stands today. Coral Planet sells to a limited number of Pet Stores. We specialize in aquacultured corals. I am an entrepreneur at heart and have ran a few other businesses over the years (flowers, web design, restaurant review, sporting goods, financial, etc.). I also have a website called aquaticdatabase.com, check it out. My wife Heidi and I have a large family -- two boys and four girls. We're all very active in the community and competitive sports. If it involves a ball of some type, you will likely find one of our family members participating. When we find the time, we enjoy skiing together in the winter and boating together in the summer. The family is very supportive of my hobby and they enjoy seeing my tanks develop. It is always thrilling to me to see them gather around to see what new and exotic "thing"dad has brought home this time. They can each recognize most common fish and they will even reluctantly help with water changes if they don't have practice. I have lived in Sandy area since I was eight years old and graduated from Jordan High School. In 1993, after received my Associates Degree, in Computer Information Systems, I started working for Qqest Software Systems as a Computer Programmer. I have always loved the aquarium hobby started with a 55 gallon FW aquarium in my office. I also had a 35 gallon FW tank at home. I especially enjoyed cichlids and eels. Another of my favorites were my Oscar and Clown Knife. My boss, not be out done, decided to start a 150 gallon SW fish-only tank also in the office. I learned so much from the club in my first couple of years that I decided that I just had to give back to the club and ran for office. The first year I ran for a presidency position I didn't make it. Very few people know who I was. The next year I made sure I had gotten acquainted with more club members and ran again. Since becoming a presidency member I have had many opportunities to serve my fellow hobbyists and have learned a lot and had a lot of fun doing so. I look forward to serving the club as President and hope to help make the club even better. I'm not only about Fish though. By trade I am a tax accountant and have recently started my own business out of my home preparing personal and business taxes and doing accounting work for small businesses. I enjoy the outdoor sports of fishing, hiking, camping and horseback riding.